Hi! Happy birthday!! It's my son's first birthday today, so you both picked a great day to be born, obviously! Hello! Fun new blog. I've added you to my Google Reader (the greatest invention in the world... said in my mind in a deep, rumbling voice. And with hand motions.) YAY. Long time reader (summer 07) and first time commenter. I must say I'm very excited to see what elseyou have up your sleeve! Congrats on the new blog! Can't wait to hear the hilarity that will undoubtedly ensue. Happy Birthday Jen. So excited about your new blog and your old blog. As for requests, we need more Dr. Who in the blog. Like a debate about which doctor is the best. I'll start: Christopher Eccleston, FTW. You have no idea how happy this blog is making me. All of my favorite things put together. FIRST IN A HISTORIC INTERNET MOMENT! Happy Birthday! And congrats on the new blog :) I'm looking forward to reading it! Consider yourself added to my Google Reader. I know - how's THAT for a birthday present, eh? Hi! I happen to enjoy your blatherings, so blather on! I happen to enjoy your blatherings, so blather on! OK, "'hi' in the comments!" Hi Jen! And happy birthday! Hi there! :D Definitely following your new blog, oh yes. I always get a kick out of reading your cake commentary. Hi! Google Reader'd here as well. Happy birthday! I've always thought your "incessant yammering" adds much more humor to the cakes than they could supply on their own! Grats on the new blog, and I'm super excited to be able to catch your witty diatribes in a new environment. CW always makes my day, and I'm totally psyched to see the lovin's spread around the web a little bit. Hi...and hope you have a great birthday! Jen, I love the commentary on CakeWrecks as much as the pictures, and I look forward to reading more about your interests beyond cake! Happy Birthday! Yay, congrats on the new blog! Hi! Love the look of epbot and looking forward to hearing your take on all things not cake. "Is there a way to combine Star Trek, Steampunk, the Muppets, Darth Vader, Ghostbusters, and the Princess Bride?" Dude...I would so totally buy that movie and even read the book! YAY! I'm so excited to read more of your yabbering! It always takes the cake for me! ... ... ::Tap Tap:: Is this thing on? So happy to see you have a new blog. I aodre CW! Hi from a cake wrecks lurker! Happy birthday! Happy new blog! Also, adorable robot necklace. Also, you have been added to my Google Reader - the only way I can read blogs. p.s. I'm a college professor and have come dangerously close to laughing out loud while reading your CW blog while my students were taking an exam. so thanks for almost getting me fired! Hi!! Happy Birthday! Very excited to see the new blog, especially after the most awesomest ribbon cutting ceremony ever! Hi Jen! I love cake wrecks and think you are hilarious! Can't wait to see what you post each day! and could that robot in your masthead *be* any cuter? I think not. Hi, Jen! I will follow you anywhere! Happy birthday and congratulations on the new blog. Long time reader and commenter, but too shy to have a name. Geekery and girliness are my favorites! 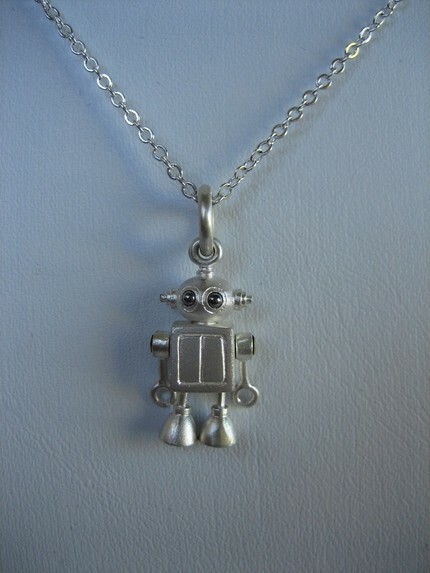 I totally think this robot necklace trumps your robot necklace. In a good way. It's too cute! I'm looking forward to reading more (and that robot necklace is super cute). I think I'm going to enjoy this even more than Cake Wrecks! Happy Birthday! Happy Birthday and congratulations on the new blog! I love CW - my day doesn't start properly until the day's entry goes online. And now I get double the fun, yay! Happy birthday! I am way excited about this blog, your wit makes me laugh out loud daily! YAY!! I so rather enjoy how you decided to name your blog Experimental Prototype Blog of Tomorrow =D You truly are a Disney geek through and through =P And I'm right there with you! Oh and a very merry (un)BIRTHDAY to YOU! Happy Birthday!! Seriously, if you substitute Star Trek for Star Wars (sorry....) I would think you were me.. you are not me, are you? I would really love it if you talked about all those things combined, together.. let's say about a certain steam operated robotic version of Wesley who lives in a galaxy far far away who always gets heckled by Statler and Waldorf the Hutt... or something alone those lines :D Very happy to be reading your new blog now..
Congratulations! I'm looking forward to your new blog. But I have a weird eye for this sort of thing, but..."hilariously" is spelled incorrectly at the bottom of the page. Your new blog has been added to my bloglist. I look forward to reading you even more! Hi, Jen! Happy birthday! Glad to see Epbot open for business! You're combining geekery and girliness in a blog? Yeah, I'm totally there. Welcome to my Google Reader! Congrats on your new blog. I'll add it to my Google Reader immediately. Or as soon as this comment posts. One of the two. Hi! Happy Birthday! Can't wait to read your new blog, and am really looking forward to your 2nd book. Yay! Having been a girl all my life and a geek for a good most of it, I fully support this blog and all it stands for. We gotta stick together, man! Hi! I am really looking forward to most posts here. It'll be nice to see what else the mind of Jen holds. hey Jen! So excited about this blog! Happy birthday! "Geekery and Girliness" sounds just like the place to be for me. Congrats on the new blog; I'm sure it will be successful. Happy birfday, Jen! Congratulations on the new blog...one of the reasons I love CW is your writing! Happy Birthday Jen! You are added to my google reader also. the comments along with the pictures always make it 10x funnier then just the pictures alone, and I can't wait to see (read?) what this blog can lead to! Happy birthday! And enjoy the new blog! Congrats. Love the design and look forward to reading more from you. That was my awesome web designers fault when we were finishing this site at 3:15 this morning. Hi! Happy Birthday! I'm a CW junkie, so I'm looking forward to seeing your yammerings on here as well! 'Ello, there. I've never found your comments on the various cakes over at CW to be annoying (who in the world would? ), just so y'know. And that robot necklace is totally adorable. YAY!!! I love that you love to write and that you enjoy the CW. Me and the kids (when it is appropriate) LOVE it. I love to write but you by far win. YAY for CW writer writing more funny things. Happy Birthday!! And Hi! I'm excited about your new blog! Was there a cake (virtual or, better yet, real) to go with your ribbon-cutting? Because it's not a celebration without cake. Congrats. That's not really EPBOT, it's the Existential Wonders of the World RIDE at EPBOT. HAPPY NEW BLOG AND (older)BIRTHDAY!!! Whoooppeee! This IS going to be fun. Especially since now I have yet one more reason to be fooling around on the computer rather than doing menial, boring things like cleaning, and checking Help Wanted ads...crap like that. I love your sense of humor, your writing style, and (pounding on door) I'm coming in whether you like it or not (heehee)! Oh, and give Trista up there your address! YAY! I'm excited to see some non-cake related yammering! I totally love that necklace, I NEEEEED one! I agree with Naomi de Plume on two counts: more Doctor Who, and Christopher Eccleston is the best. Yaay new blog! It makes me feel warm and fuzzy on this cold, rainy day. I look forward too all the geeky girlie-ness you can throw our way! Happy Birthday, and happy new blog birth-day! I want that robot necklace too, too cute!! Hi! You crack me up every day on CW, and I look forward to more! HAPPY BIRTHDAY! keep up the yammering, its the highlight of my day. Plus, it's kind of scary how much we both enjoy the same things. Yeah. The only other online personality that I have so many interests in common with is Greg Dean of Real Life: The Online Comic. I guess what I'm saying is that I feel like I'm keeping good company, and I'm looking forward to enjoying your new blog as much as Cake Wrecks. Yahhh for a new blog that isn't all cake! I've always thought I find you so entertaining because we love the same stuff! Can't wait to hear more of what goes on in that head of yours! Congratulations on opening a new blog but be careful, we all love you too much to see you getting too tired !! Oh yay, more fun for me! Congrats on the new blog. Happy Birthday, and count me as a follower on this blog as well! I just realized I don't know how to spell maniacally ... maniacly? Not a word I type often. and congrats on your new blog! am looking forward to reading more of your inane blathering and incessant yammering!! Love. Love love love. Happy birthday! Your commentary gets me in trouble at work all the time because I laugh out loud from pretty much every line. I look forward to getting in trouble from EPBOT laughter, too! Woot! That is a pretty cute robot necklace. Have a great Bday! Happy Birthday. I never leave a comment but i am one of the silent ones who loves cake wrecks and loves to hear you yammer. Good luck with this new project. I will be sitting here in the background reading on a regular basis. Just gotta say... LOVING this idea. Cake pictures are nice, but I read mostly because you are awesome. And now I get more awesome-ness! Score! hi! love Cake Wrecks and am excited to see what you have in store over here. I lurk regularly on cake wrecks, and I love your quips. I'm so glad you have a more general platform to amuse me with now. Yes. I expect to be amused.... but, no pressure or anything. Happy Birthday! I have to say I LOVE the name Epbot! Happy birthday to you and your new blog! You had me at "Is there a way to combine Star Trek, Steampunk, the Muppets, Darth Vader, Ghostbusters, and the Princess Bride? If so, I WILL FIND IT." Your new blog has, with a few words, been instantly added to my morning read. I find your incessant yammering to be the best part of CW, myself. If you're looking to collect general geekitude, I have an experiment of my own you might find interesting. http://speedingblogger.blogspot.com - it's a superhero story told entirely in blog updates, emails and social networking media. I'm looking forward to hearing more about your non-cake-related life and world! Hi! The commentary for CW is the best part. I love a well-turned pun. Speaking of: did you see Colbert's Best Pun Ever segment? I think it aired maybe a week ago Thursday - within the last two weeks for sure. It was AMAZING. You should look into something like that. You have a direct line into my funny bone. Yammer away, my friend. Yammer away. Happy Birthday, Jen, and I am so excited about MORE of your intelligent humor out in the world! First, "Hi in the comments!" Second, I think you're funny. Otherwise it's just ugly cakes. Funny comments is what makes it work. SO happy you have this new blog! I love your "yammering" and can't wait to read more. hello and happy birthday!! looking forward to more posts and adding this to my small list of daily must check blogs!! Hi and Hoppy Brithday! I love your yammering comments and inciteful intelect. It is so refreshing and I love the way you think!! I look forward to your releases of cranium contents. Keep up the good work. Looking forward to the pages turning here. "I'll be back"
my verification: 'ulfultru'.. is that a bit like a futuristic Cthulu? Happy Birthday! I am sooooo looking forward to your new blog! You're yammering really makes the mornings worth while, cake or no. Hey Jen, I have to say I'm so excited about your new blog. Your so-called yammering is what kept me coming back to cake wrecks for more (plus you live in my hometown!). I have "enlightened" my whole office and they are now fans of yours as well. Good luck and happy birthday! It's only $88? Put up a tip jar with an $88 dollar goal, you'll see it get filled fast. Or we could do a 5k...they're always trendy. "Sponsor me as I walk for Jen's Robot Necklace"...catchy. Oh, and Happy Birthday to you and your new blog! Thank you for adding another blog that I have to check out before I can officially start my work day. I love your yammerings! HI! and your "yammering" is what I find most enjoyable about CW. So, a full on "yammer" page sounds awesome. Happy Birthday Jen! I'm so excited to read your new blog! I love your yammerings. I find it makes the cake wrecks even funnier! so I can't wait to see what funny things you have in store for us ;). And if you weren't taken already, I would give John a run for his money ;). lol.....Anyway, Happy Birthday and I hope its a great one! "Is there a way to combine Star Trek, Steampunk, the Muppets, Darth Vader, Ghostbusters, and the Princess Bride? If so, I WILL FIND IT"
What no Dr? I think you mentioning that on Cake Wrecks is finally why I was able to get my wife to watch it with me. Happy Birthday from one of the "cool ones" from Framingham! Well, glad to see I am not the only crazy blogger up early writing away! I am a yammer type follower, so give it your best go...I will be here reading!! Congrats on the new blog,I have often been left wanting more after reading my daily CW's-So Thank You for more. Hello hello, and Happy Day of Your Birth! Oh yeah. I diligently read your words, because I <3 them, so yeah. I'm so in. Besides, I'm a geek too. No, REALLY. Yay!! Have a wonderful birthday!! Hey! Happy Birthday! I am excited to hear about all the other geeky stuff in your life. Did you know Geek Pride Day is coming up? I'm sure you do since it's the same day as Towel Day! Geeks Unite! 'Hi!' LOL. Happy Birthday of course and "yay!" on the new blog. If you get that necklace, I will have to come steal it. Great idea. As an daily wrecker I'll plan to visit this site too! Happy birthday! Looking forward to book 2, bookmarking Epbot. Thanks! And... saying HI! Happy Birthday, and don't take the haters seriously. Apparently if they just like the pics and not your "incessant yammering" then they don't have a sense of humor. Have fun, and HAPPY BIRTHDAY!! Happy birthday, Jen! :D Adding this to my daily blogroll. Hi, Thank you for adding to my day! Hi and Happy Birthday!! Can't wait for more yammering LOL!! insanity shall follow.. and i for one, am excited! I thoroughly enjoy CW, and look forward to reading this new blog. Hi! Loyal CW fan here. New venture = awesome. Looking forward to it! Jen, this is BRILLIANT! I'm so stoked! I totally understand what you mean--I have a family blog, and yeah it's fun and I love doing it. But there's just more to me than only my family, y'know? So I totally started up a top-secret second blog just for the people who can handle *me*, talking about things other than my (even if I do say so myself) insanely adorable child. I'm so stoked to add this to my Google Reader feed! PS> HAPPY BIRTHDAY! Let there be cake! Do you really need one more person to tell you how funny you are, how I would follow you to the ends of the bloggy-world to snicker at the very things at which you instruct me to snicker? Yes? Oh. Okay. No problemo. Jen, we wuv you. Happy birthday and happy second blog! Hi! Yay! This is *awesome*! Hi! And happy birthday and yes some of us find your yammering funny enough to check back every day for new posts! And I like your constant yammering. It wouldn't be CW if the commentary wasn't there... it would be some scary world where I'd fear ordering a cake from any bakery. Hi! Jen, you rock! Also, love the necklace. Someone can buy me one too! yeah a blog where you can talk more!! I love CW but I am really looking forward to reading this one. "HIYA"
Couldn't resist. The older I get, the more my inner 6-year-old takes control. Hi! Happy birthday also. I read CW every single day at work, but this is my first time commenting. I'm really excited about your new blog.....but what I'm most excited about is you sending me that extra robot necklace you get (since you are getting about 20). If not, that's cool. I'll just start a rival blog of gross looking restaurant foods, become super popular, and post my 9 page amazon wish list on it. Cool? I'll pay for shipping. I have a USB key that looks just like that necklace, only in PINK and with flashy eyes that twinkle when you plug it in. A new blog is born, I hope you get your necklace. This is so cool. Every morning my grand and I read CW and laugh and scratch our heads and giggle and wonder....how do they do that? I am so glad you're doing this too. Happy Birthday from my just turned 10 years old double digit granddaughter.....Holy Guacamole lots of comments and love already on this bloggie comment page. Yay for you. Sheldon popping out of the balls & yelling to Leonard: Bazinga! You never fail to make me laugh--often out loud (not an easy thing to do). Hi! Happy Birthday! Also, I'm totally longing for that little robot now too! OH! And theres this book you should read....Chicks dig time lords" A celebration of Doctor Who by the women who love it. Here's a link! I have just always loved that you like him as much as me! Hope you like the new guy...he's for sure no Tennant....sigh. Happy Birthday to you and your new Blog! And I LOVE the name - Epbot! Had me giggling from the title. Well done!